I decided to take the plunge - my first blog! My favorite time of the year presented me with the perfect opportunity to start with a blog. Well here goes. The few weeks just before Christmas are usually the time that my son and I have a ball of a time. He gets to come and visit for at least a week and in this week it is just magic. 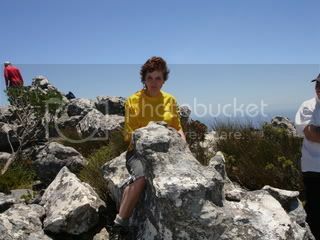 This year round it was more so since he decided to that we should take a hike up on Table Mountain. 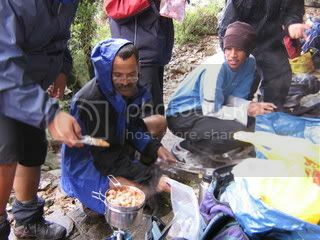 Now Table Mountain is thé major landmark in Cape Town. I missed out on a couple of days' Stewing - sigh - however, I hardly had time to Stew since I did not even go online for what seems like ages now. As you can see, I would have been foolhardy if I was to have taken a laptop with me. 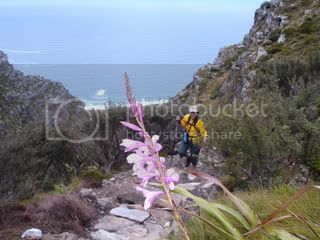 Here I am taking a break - this in on the GrootKop area on Table Mountain. That is my boy waiting for me to make it up Corridor Ravine. Finally the descent down Lion's Head. All I can say is that it was major fun and I am looking forward to next year's outing. This outing was five days long and sleeping in a hut on the mountain made me feel like I was camping again and the views are to die for. 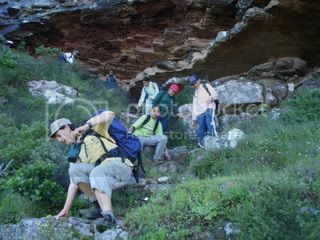 It sounds like a great hike...and...it LOOKS like great fun, too! The fotos give a good feel of the walk. BTW...what is that flower sticking out in the first piccy? It almost looks like a glad. That flower is a Watsonia. It also reminded me of the Gladiolus. Both Watsonia and Gladiolus do indeed belong to the Iridaceae family. Your hike looked like a lot of fun. There is such a world of difference between the snow photos being posted lately and your photos. It really is a world of variety. Looks like an enjoyable trip, Palm Tree. Like Frank said, it's funny to see people wearing shorts while I'm wearing woolen underwear. 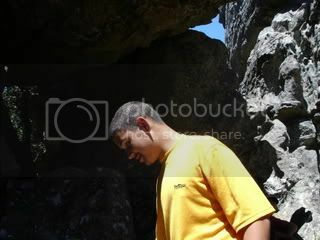 :) If that's you sitting by that rock, and that grown man is your son, where is the Fountain of Youth? Oh Droopy you are too kind. Fountain of youth indeed. Now you see why I say I can't wait for grandchildren anymore. Alas, it is the children who have to decide that one. Take heart in June I will be the one wearing thermal underwear. What fantastic photographs. They made me feel quite warm looking at them while we have temperatures of -12 degrees here!! I agree with Droopy - you don't look old enough to have such a grown up son. Any tips for us aging females who aren't wearing as well as you are? As you will notice, it is not a closeup. - trick not to show age. I guess since I still run and swim regularly and try to eat organic as far as possible, I stay in "shape". I do however have a problem with my back. My mother is almost seventy-eight and she still looks good. I guess I have her genes.